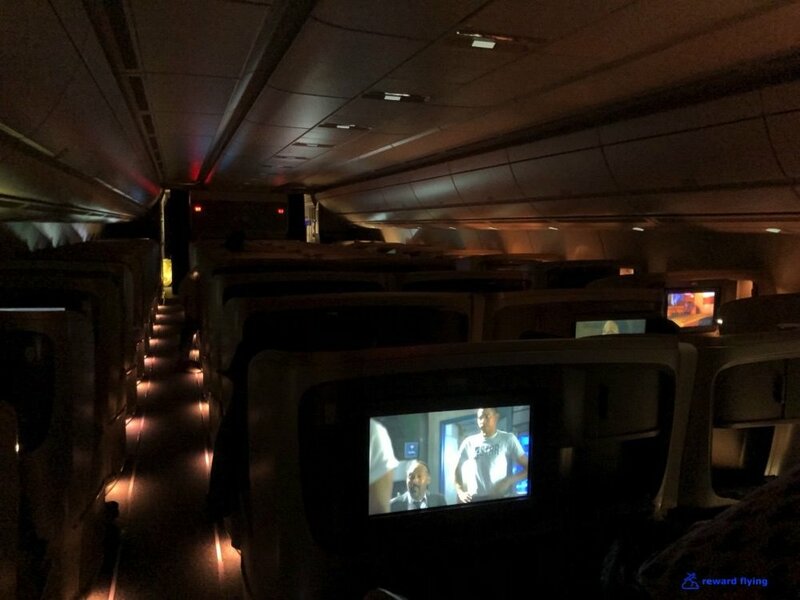 The redemption that ended this journey was on Singapore Airlines new Airbus A350 Ultra Long Range with its premium class only configuration. This flight would the first from Singapore to San Francisco using the A350ULR. 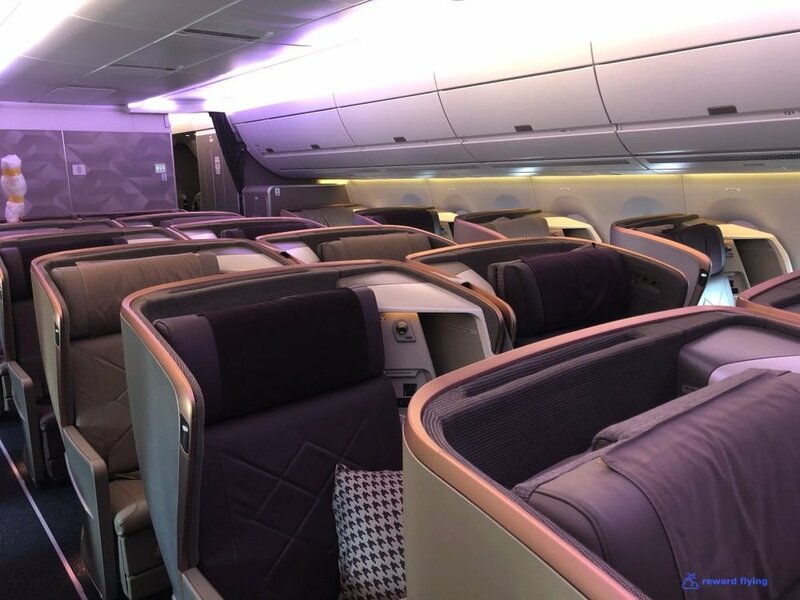 SQ also flies their standard A350 along with Boeing 777 4 class service to San Francisco. Obviously the ULR aircraft is not needed on this flight. The plane also flies to Los Angeles where other aircraft can make the journey and to Newark where this aircraft is necessary. Newark receives the current banner for the world’s longest flight, clocking in at around 19 hours. My flight to SFO was scheduled for about 14 hours and I have to admit, time flew by. This was a very comfortable flight on a beautiful aircraft. 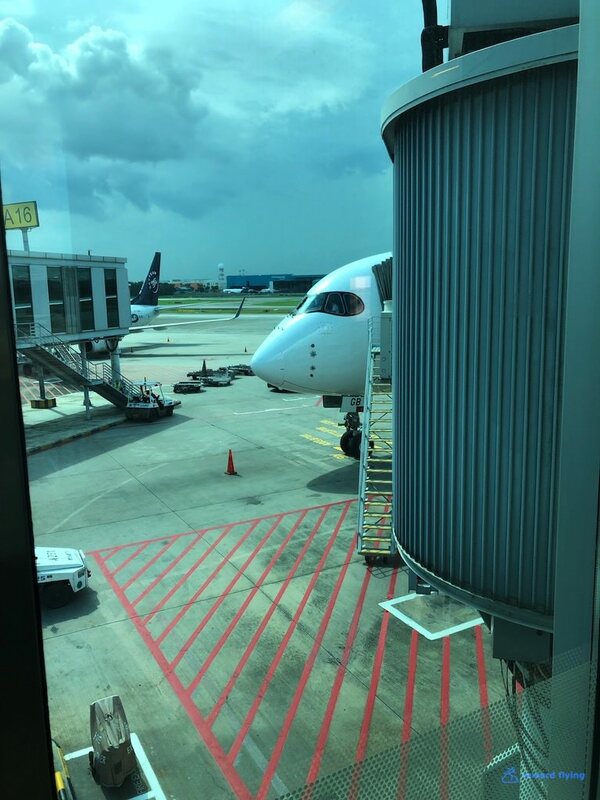 After spending the morning in the East Coast Village area of Singapore I headed to the airport for my 15:00 flight home. Today there would be no issues with checkin! 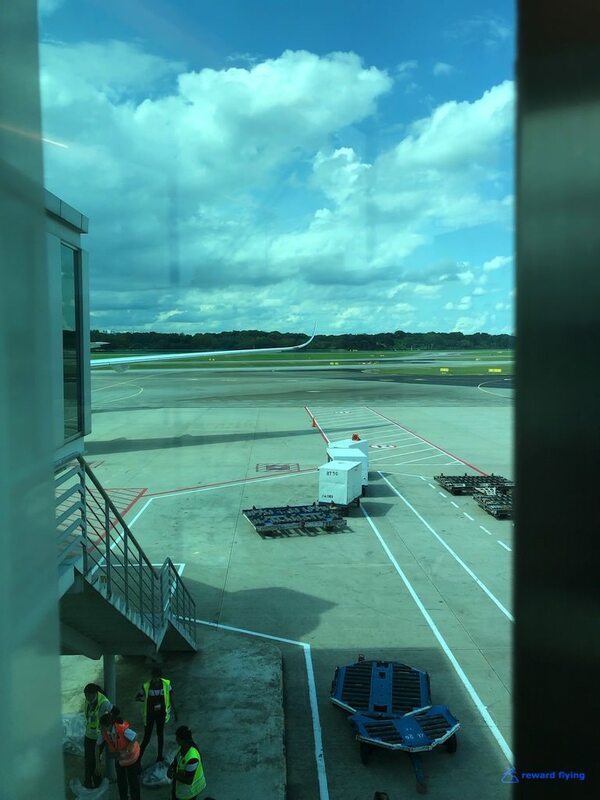 When I arrived at Changi I was greeted by tropical weather. But after I received my boarding pass, seasons changed. 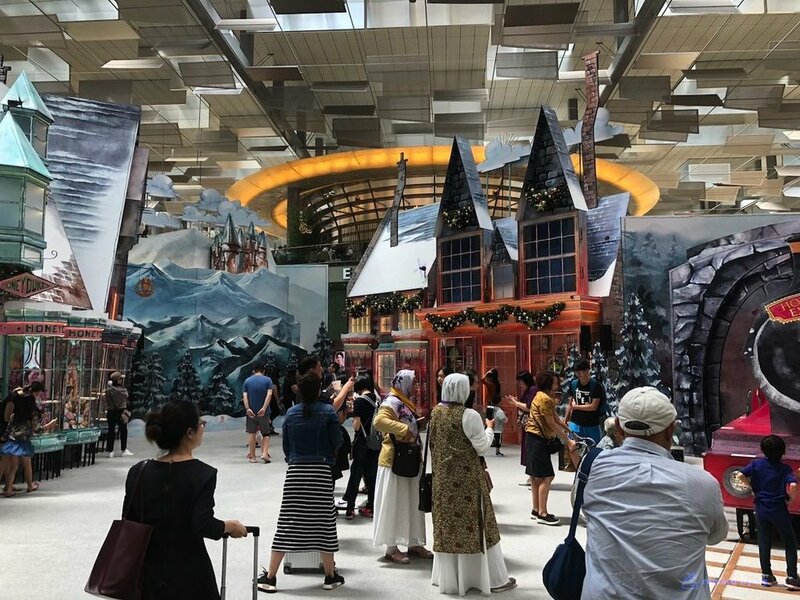 This is as close as Singaporeans will get to snow! 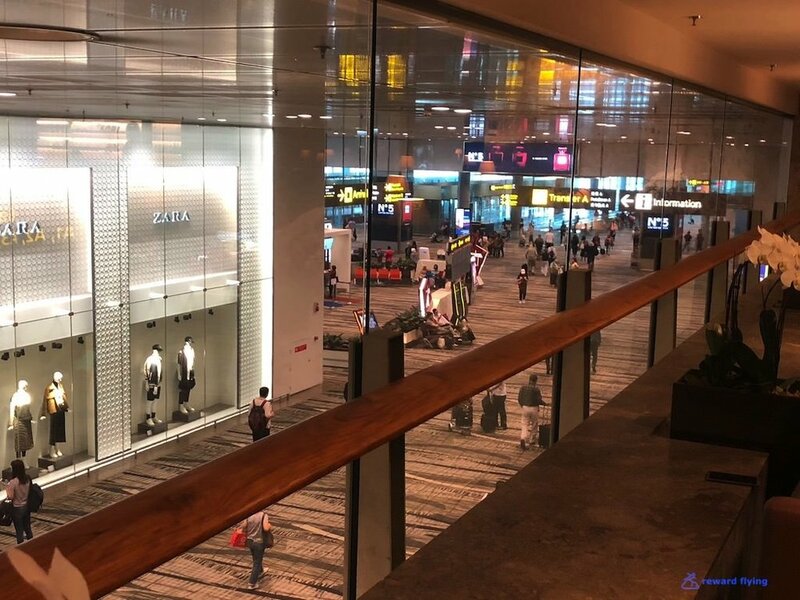 I’ve been to Changi many times, but never in Terminal 3 SliverKris Business Class lounge. It’s nice facility, except instead of a view of the tarmac you get a view of the terminal. Or is it a shopping mall? As you can tell the lounge is dark, reminding me of China Airlines lounges in Taipei. One of these photos shows the back of a male, next to him outside the photo is his family, a mom and young boy about 2-3 years old. He was making a fuss as young boys that age do from time to time. I was feeling sorry for the people who would be sitting next to him on whatever flight he would be taking. On SQ34 my seat was 11K. The young boy was in 12K. Being the “inaugural” flight for this A350ULR to SFO, I expected there would be some kind of ceremony, maybe a cake, some balloons or a trinket commemorating the event. Not so. Singapore Airlines had received their 6th A350ULR a few days prior to this flight. My hope was that aircraft would be placed into service on this flight. Instead we got SQ 9V-SKB, an ancient 2 month old Airbus A350ULR. And a gorgeous cabin as well. With no luggage bins in the center the cabin is open and airy. 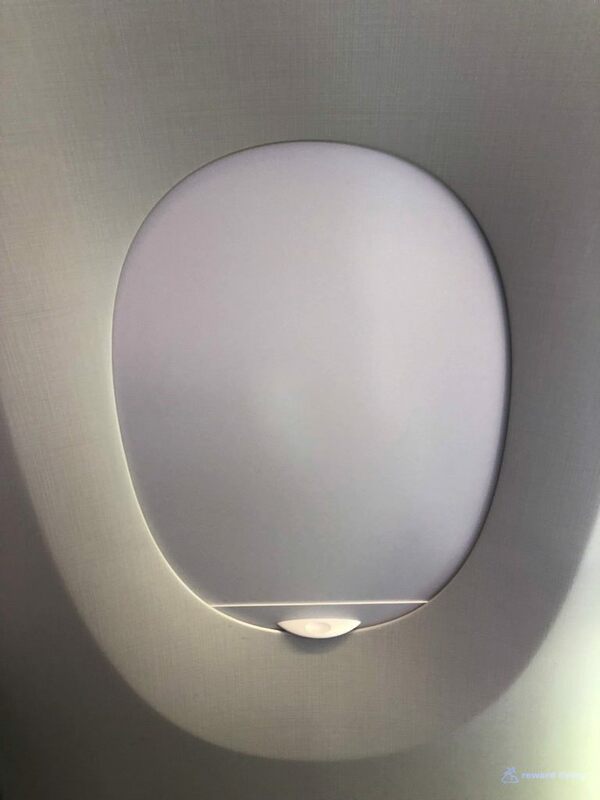 Windows seats, maybe stand up slowly. This is row 17 at the back of the front cabin. Very private. Row 11 bulkhead. Bulkhead seats are the preferred seats on this aircraft due to increase legroom. 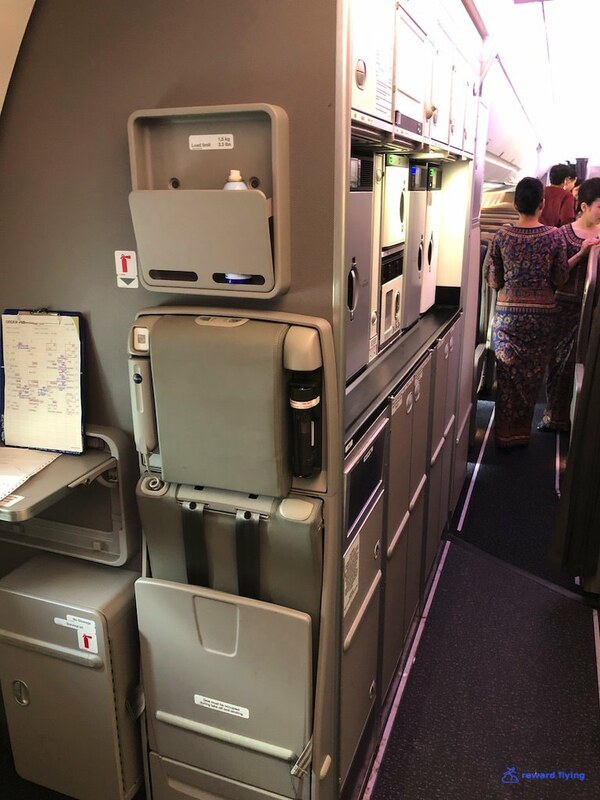 Galley layouts are different in the ULR than the standard A350 for Singapore. 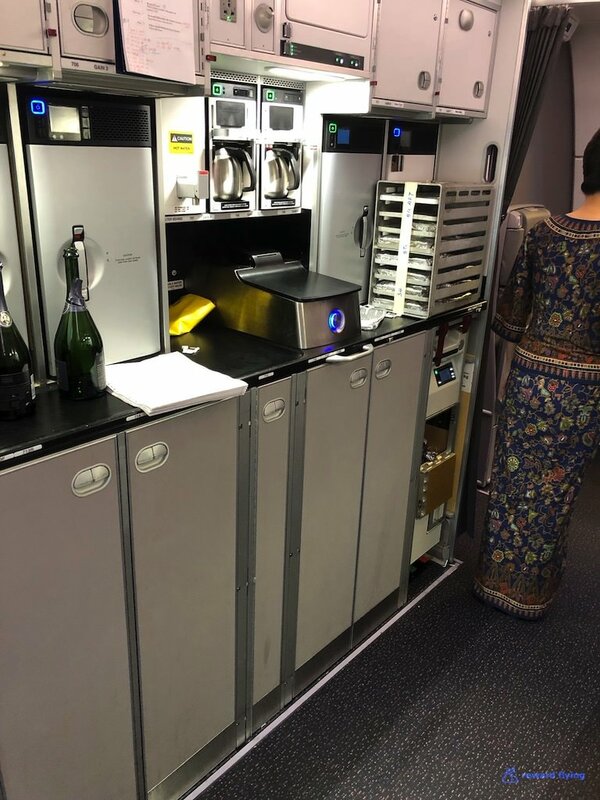 I can’t imagine the flight attendants are too pleased with a galley in the aisle to the second business cabin. And in-flight I’m sure the passengers aren’t pleased as well. I’d stay away from the first few rows of cabin two, maybe grab your seat starting at 21 or 22 and back. The front cabin, rows 11-17 any seat seams fine with 10A window, 11D/F center and 11K window being the best. Although 10A has galley exposure and and all these are blocked for Krisflyer members or assignment at the gate. Or call in to Singapore, beg, and sometimes it works. Like it did for me on this flight netting me 11K. They changed the seat coverings on the ULR. MUCH more comfortable. The the A350-9 seats I thought were too firm. These had a nice softness to them while still providing good support. Seat 11K has a wider footwell along with a bench to support your legs. At 6 feet I didn’t need the footwell. Other seats look like this. Privacy is decent. You really can’t see anyone, at least their face while sitting. Crying and screaming is another matter. 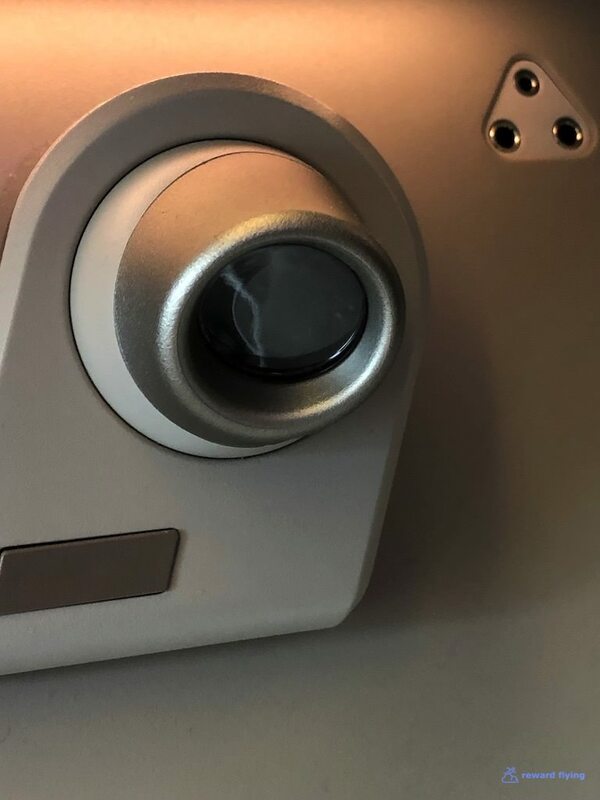 Singapore did not get the electronic double shade as Qatar did on their A350’s. Due to the size of the window it’s my guess these shades are going to have issues down the road. Nor did they go for air nozzles. Nor did they go for the Airbus outside cameras! At least the IFE content had a selection featuring the person who inspired me to see the world and reward fly. The lavatories are standard size, stocked with Singapore amenities as well as a step opener for the trash, nice! The problem is they didn’t put enough lavatories in this aircraft. By my count there are only 3 lavatories for 67 business class seats. The 2 closest to the front cabin are at door two, which is where most of the rear cabin goes to use the lavatory as well. That galley area has to be a mess before landing. 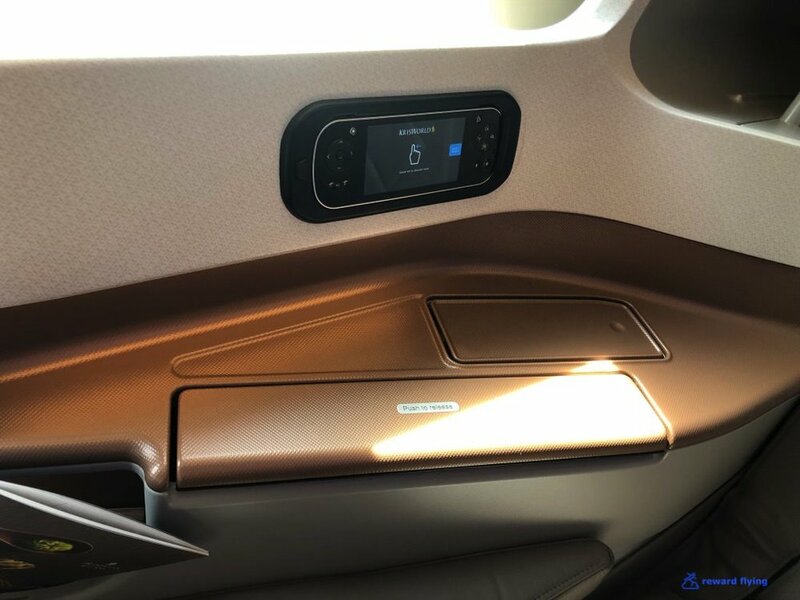 Seat controls are nicely placed on along side of the seat. They require a firm, very firm press. At first mine didn’t work. 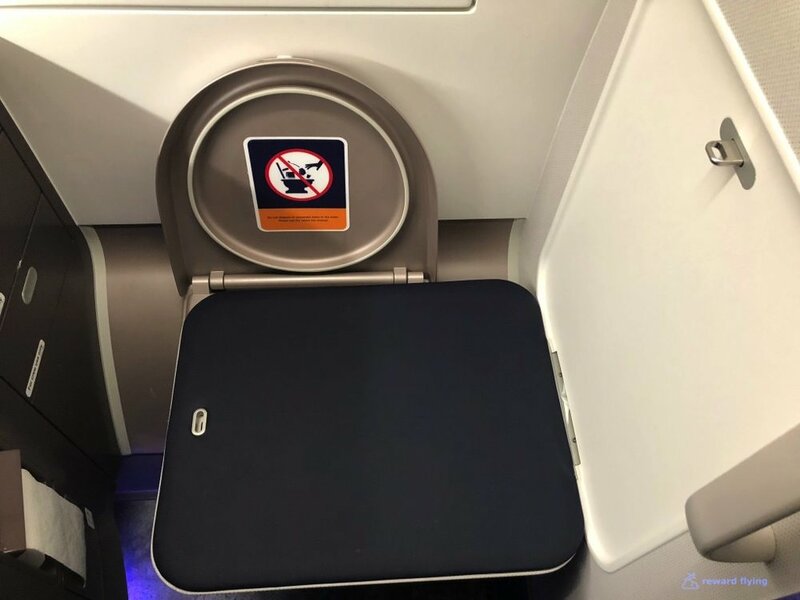 The purser reset the seat and they still required a strong press to move the seat. This is good as you eliminate the accidental touching of buttons which is all to common on many aircraft. There are audio jacks on both sides of the seat. On the other side is a nice compartment that holds your power supply, audio jack, a reading light as well as a large compartment that fits tablets and laptops. The side table holds the meal tray, has a phone or stuff compartment as well as being a precarious place for your beverage. 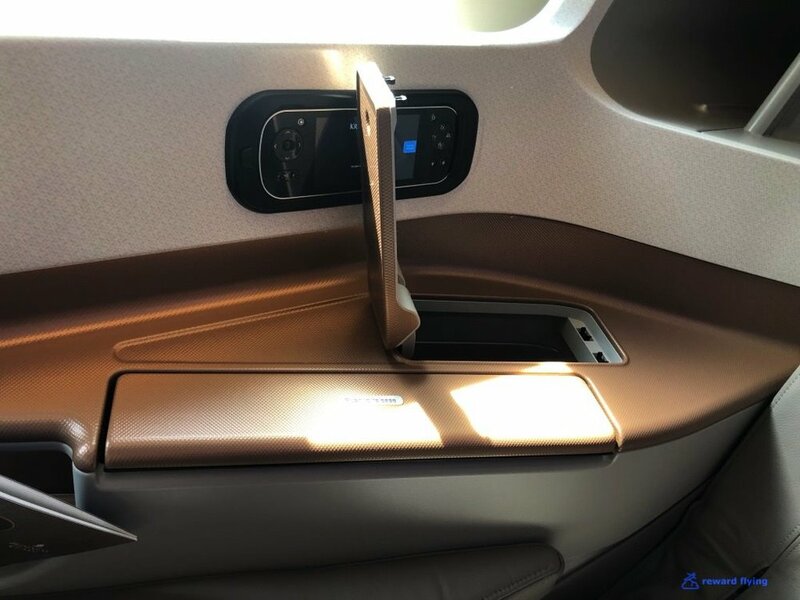 The touch IFE monitor is not large, but has excellent clarity and given the proximity to where you sit, works well. Sliding the door this is off to the right reveals a small mirror. Positioning???? Socks and slippers were passed out before departure. 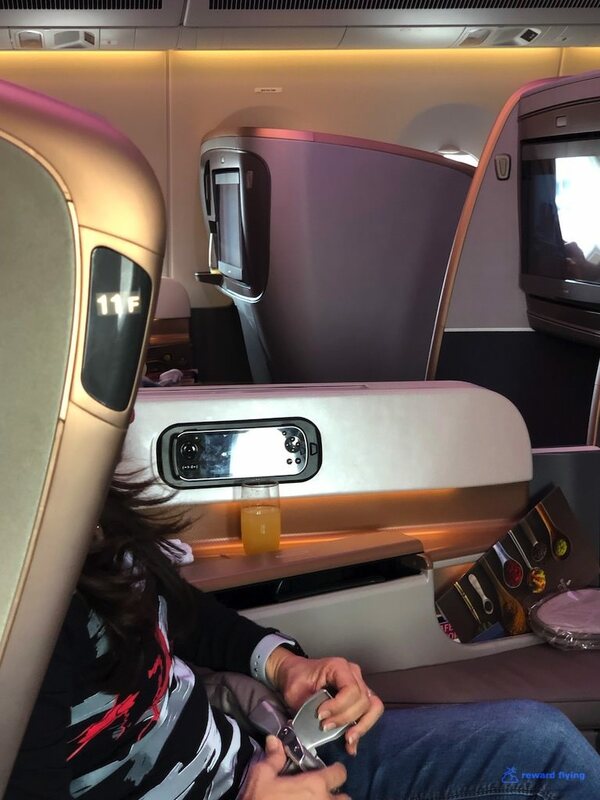 Singapore does not give premium passengers sleep-suits on a 14 hour flight. 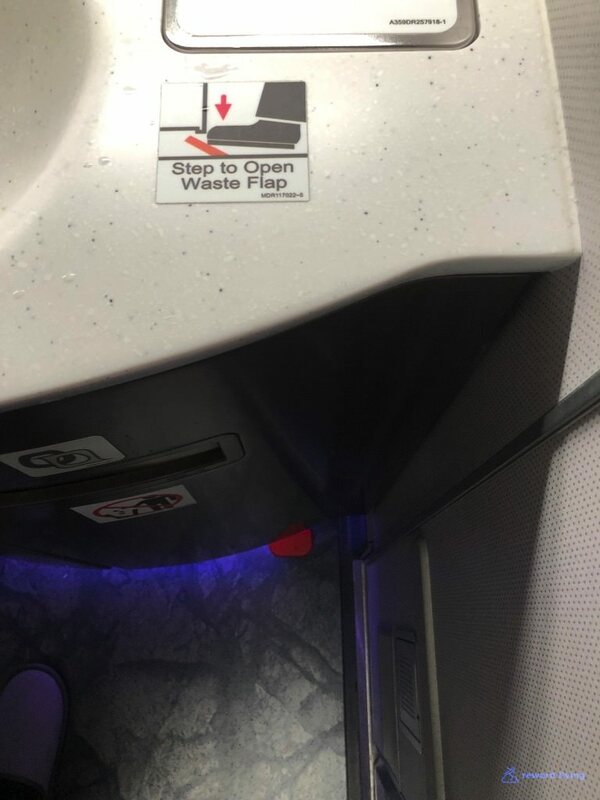 Come on Singapore, even United does from Singapore! The amenity kits were not distributed until landing. Presumably because most of the kit is to care for your clothes because you slept in them. The serving schedule. This is not dine on demand. 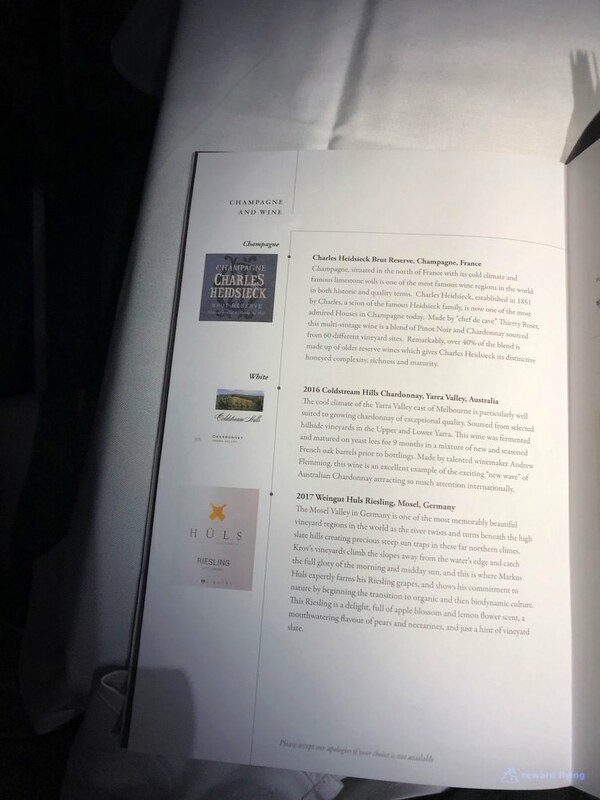 The wine menu for this flight. 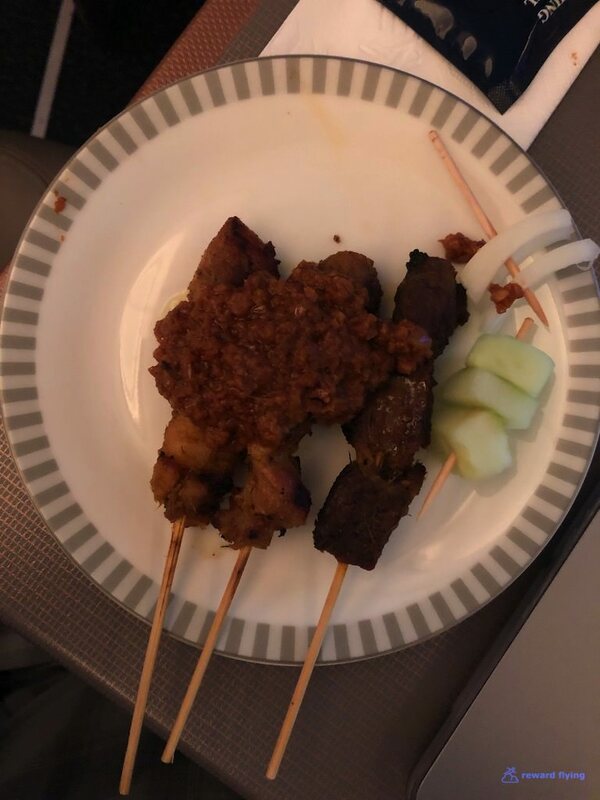 While I was looking over the menu, the famous satays were served. 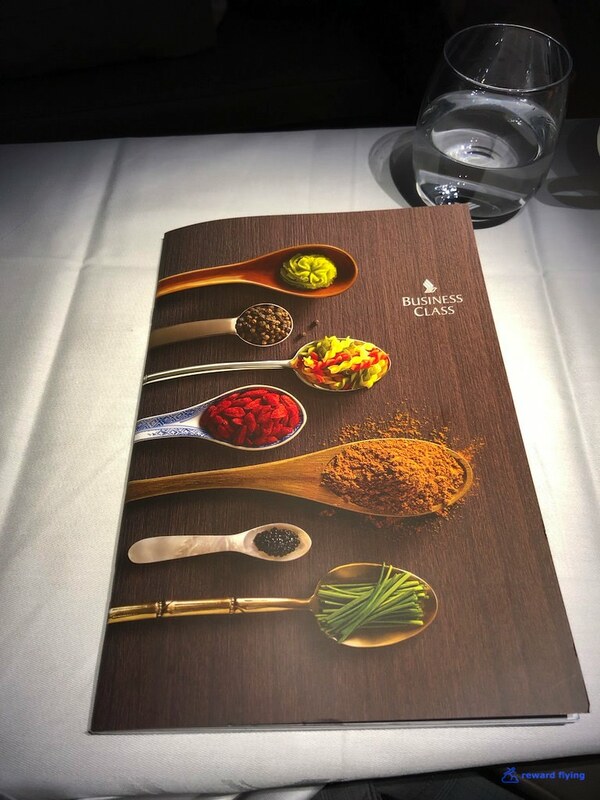 Singapore has introduced a menu on ULR flights partnered with Canyon Ranch. The idea is a healthy alternative to standard airplane food. I’d read other comments that the dishes were tasty. Book the Cook didn’t inspire me for this route for the main meal so my plan was for the Canyon Ranch menu. The FA was strict about mix and matching items between the standard and Canyon Ranch. For example if you get the Canyon Ranch you can’t order cheese or swap appetizers. The appetizer of roasted beets and buratta was very good, albeit a small portion. You can get a sense of the size of the dish based on the silverware length in relation to the tray length. Next was the main course of beef short ribs. Very tasty, but being restricted to 307 calories it was a small serving. I am not complaining about the size of the dish, simply pointing it out. I was quite satisfied after this meal. The whole intent of Canyon Ranch is a healthy lifestyle. Part of that is proper portions. About this time of the flight the young man in seat 12K had enough of flying and began to protest. The protest went on for a few hours. He was uncontrollable. His parents tried everything to no avail. I felt bad for them. A few gnarly passengers asked to be moved. I resorted to these, wishing I’d brought my Bose noice cancelling headphones. One of the FA made my bed. The bed is firm but comfortable. Granted I was very tired from this round the world trip, but I slept soundly for about 7-8 hours, on my back (normally side sleeper) with headphones attached and a crying toddler behind me. In this position I could have easily contributed to the noises in the cabin! For the most part I slept through this mid flight service so I can’t comment on any of these items. The second proper meal service was presented very early, like 2 1/2 hours before landing. Since you are able to view the menus on their phone app or website, I decided I’d rather have breakfast and ordered poached eggs from Book the Cook. Since the poached eggs replaced the main course I was entitled to the appetizer along with other items. The duck breast was excellent! Book the Cook poached eggs. 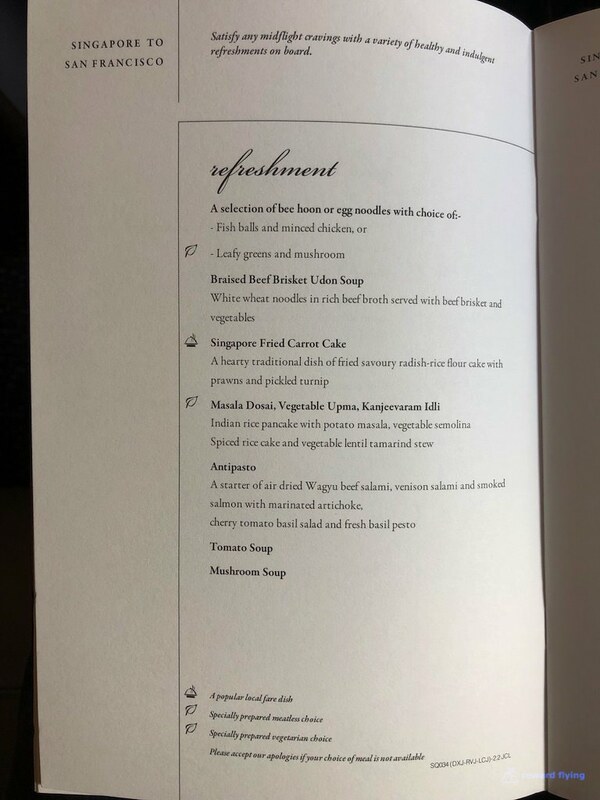 Not much care was given to the presentation of any dish on this flight. Obviously way too much hollandaise sauce, but the food was tasty. Except for the hard boiled, err, poached eggs. And finally Green Tea Tiramisu cake. And before you knew it we arrived on time. Before deplaning I mentioned to the parents of the young boy that I thought he did great on such a long flight. I sure they were embarrassed. However I wasn’t trying to make them feel better. The young one did pretty darn good for being on a plane for 14 hours. As did I. The A350 ULR is a great plane to fly. I wouldn’t hesitate to fly it again! 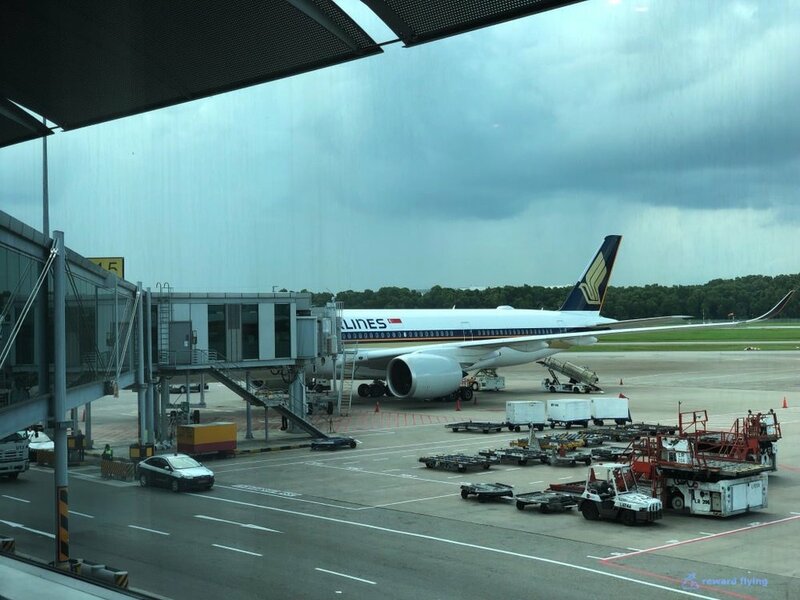 This flight was part of a Singapore promotion for the new ULR. 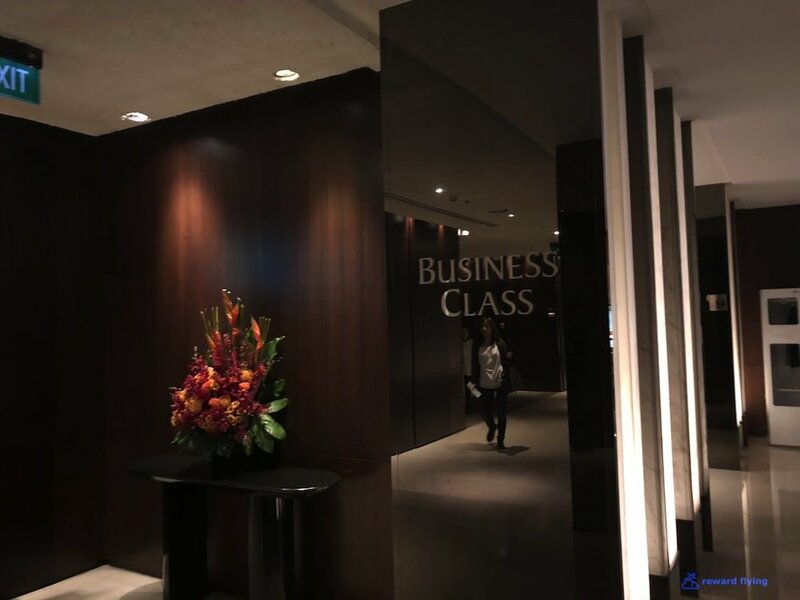 All of the flights were reduced to 65,000 points in business class. At the time I believe the standard rate was 88,000. 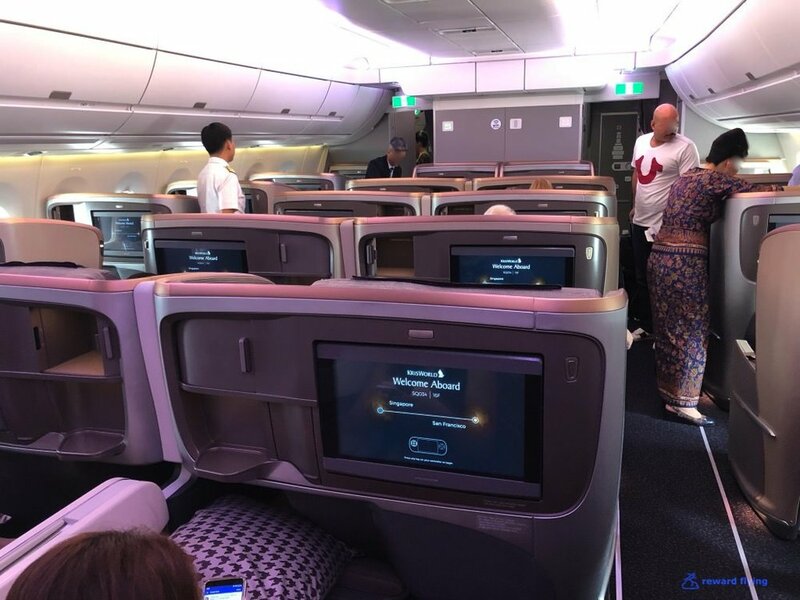 However, recently Singapore Krisflyer devalued their award chart and going forward the saver award for this flight to the west coast will cost 95,000. East Coast redemption (EWR,JFK and IAH) are 4,000 extra. 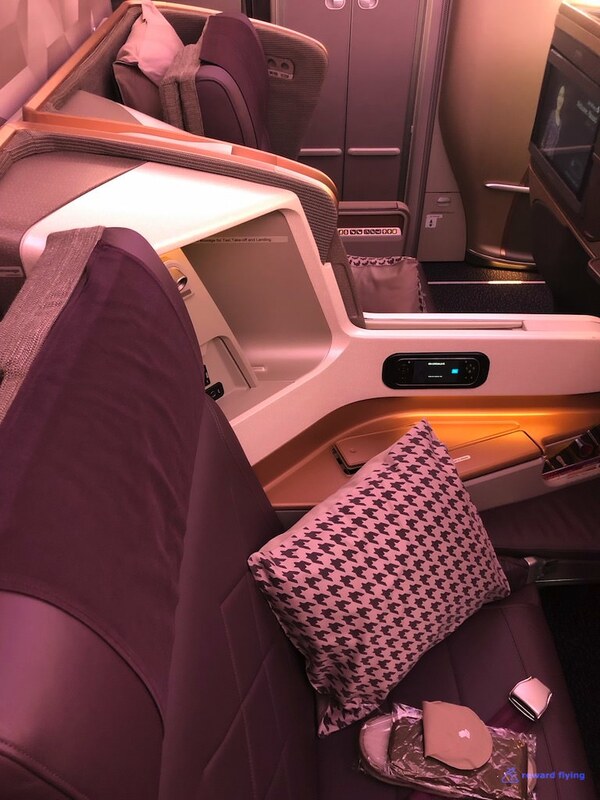 You can only get this premium class award on Singapore using their points. Star Alliance doesn’t get Singapore Airlines international availability. ✔︎I liked this seat more than expected. A 14 hour flight is a long time, I felt no ill effects. If only you didn’t have to sleep on an angle. ✔︎No amenities to speak of. ✔︎I felt the presentation of individual plates were somewhat sloppy. ✔︎The food was decent. Canyon Ranch is a good choice for travelers wanting a healthier option. ✔︎ IFE was good. Content was good. ✔︎ WiFi was available. I did not connect. ✔︎This crew was somewhat indifferent. They certainly didn’t have the grace of a first class Singapore crew. But they preformed their duties and were pleasant.